In May, Zalando bought the shopping app Amaze. Zalando was the shop backend for the blogger/influencer created content on Amaze. Amaze was the only app on Zalando’s new platform that did not come from Zalando itself. Surprisingly, the young startup didn’t stay independent of Zalando for even a whole year. 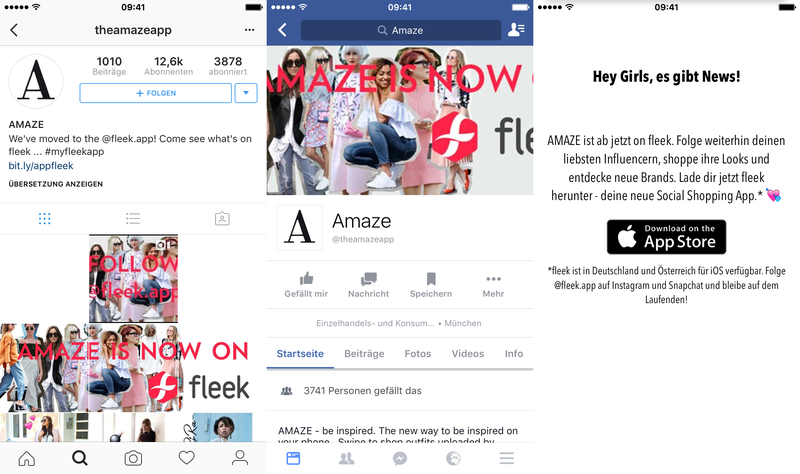 Now, Amaze is getting integrated into Zalando’s social shopping app Fleek, starting with Fleek 2.0. Amaze is communicating this to its users via the app’s Facebook and Instagram accounts. Opening the Amaze app brings up a screen that has a short message for the app’s users telling them that Amaze is now a part of Fleek and a link to Fleek in the app store. Yesterday, we were wondering about how Styles (collections of outfits) were introduced in Fleek 2.0. Instead of opening up a new tab within the start page of Fleek, Styles would make more sense as part of the Collections tab. Both are curated, stay with me here, collections of items. Collections are compilations of items (pants to wear at the club, bags for the beach, etc. ), Styles are outfits (a jacket, pants, shirt and shoes). Seeing now Styles as the new incarnation of Amaze within Fleek, the decision for the new tab makes more sense. So, in essence, Amaze has become the Styles tab in Fleek. We have contacted Zalando PR and may update this article with new information.